The pattern is easy to follow and complete with great instructions and colored diagrams. "Meet the Snow Day Block. 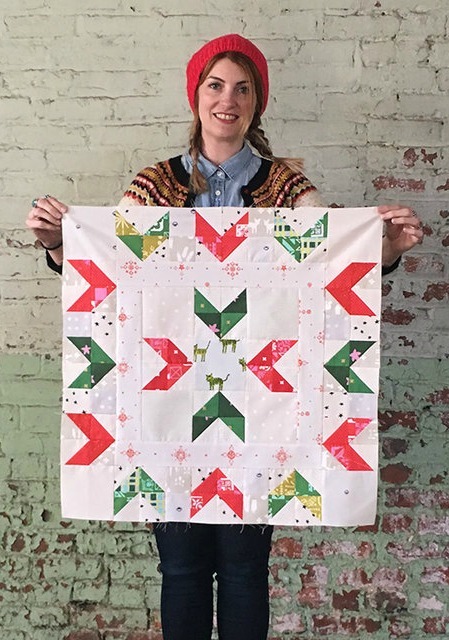 We used the Winter Whites Stack, and the Merry Stack from the shop to create this block. This simple to sew block uses half square triangles and squares, along with a simple inner border to keep the sewing easy. It reminds us of a warm cozy knit sweater, perfect for wearing out into the chilly air of a snow day. This block finishes at 24" so that a sizable quilt made from these blocks would come together quickly. Or, make a pillow cover out of your finished block for a comfy and generously sized pillow."